THE TRACKER MORTGAGE scandal has shone a light on “the culture” operating within the Irish banking system today, said the Finance and Public Expenditure Minister Paschal Donohoe. Yesterday, the Central Bank said the numbers impacted by either being denied a tracker mortgage, or being put on the incorrect rate, could rise to 20,000. “For me as Minister for Finance it shines a light into the culture of our banking system for a period, but what is now of concern to me is it also shines a light into the status of the culture of Irish banking now,” he said. Speaking in Limerick and Galway today, Donohoe said the testimony of customers affected at last week’s Oireachtas Finance Committee showed just how badly and hurt people have been by tracker mortgage scandal. Next week, the chief executives are due to meet with the minister on the issue. I will be meeting with all of the chief executives of all of the banks involved in this next week. I will be emphasising to them that this is unacceptable, that we are not talking about consumer matters here, we are talking about the lives of citizens that have been badly hurt in too many numbers by the way in which this issue has been dealt with historically and by how it is now being dealt with now. It needs to change and I will be meeting with all of the banks next week to emphasise that this is both unacceptable and we need to see quick progress in relation to it. The minister said he would be wait until after his meeting with the bankers before he comments or makes any announcement about what possible sanctions the government might place on the banks. “I will comment on options that might be open to me after I have met the banks on this issue,” he said, adding that he will be conveying a message to the banks in the strongest possible terms that this issue is “unacceptable”. There is a banking levy already in place to deal with cost to the irish taxpayer for stabilising the system during the crisis… In the aftermath of those meetings and depending on how those meetings go, of course, it will be open to me to consider other options. The minister did not give any indication that the Central Bank might be given more powers to deal with the problems, stating that the governor Phillip Lane said the powers he had are sufficient to dealing with the issues. However, the minister added that the legal changes to the Central Banks powers were introduced in 2013, and cannot deal with problems retrospectively. 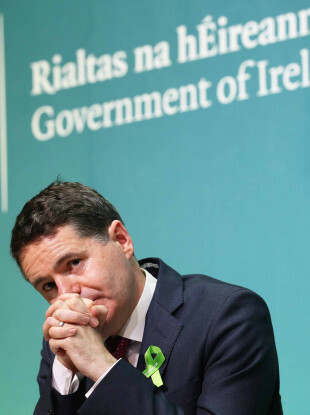 Donohoe said it is up to gardaí to determine whether or not there is sufficient evidence to investigate how the banks dealt with tracker mortgage customers. “That is a matter for An Garda Síochana. The Central Bank governor said cooperation and engagement has taken place between the gardaí and the Central Bank. Both those institutions are independent to government and it is up to them if they want to initiate an investigation,” he added. Donohoe said he was concerned to hear yesterday that the number impacted could rise, stating that it “underlines to again how unacceptable this issue is” given that this scandal has been going on for so long and the full-scale of it is still not known. Five of the banks are due in to meet the minister next week. KBC, Bank of Ireland, and PTSB are due in on Monday, followed by Ulster Bank on Tuesday and AIB on Wednesday. Email “Paschal Donohoe: Tracker mortgage scandal 'shines a light into the culture of Irish banking' ”. Feedback on “Paschal Donohoe: Tracker mortgage scandal 'shines a light into the culture of Irish banking' ”.